Irina Gonikberg Dolinskiy is a corporate/business attorney, as well as a classically trained pianist and an avid writer and storyteller. Having practiced law in New York for a number of years, Irina is now a partner at a law firm in Central Florida, where she resides with her husband and her daughter, Jayne. Irina's son, Mitchell—the original audience and inspiration for her stories—lives and works in New York City. Grammar can be dry and boring, or it can be vivid and mnemonic. 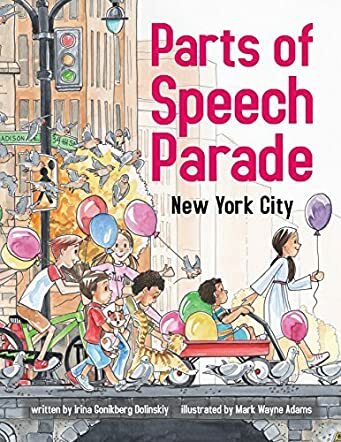 Parts of Speech Parade, written by Irina Dolinskiy and illustrated by Mark Adams, dusts off the basic parts of grammar and introduces them with rhyme and rhythm set against colorful New York City. Children of New York City parade through the streets (with balloons!) passing by scenes of daily New York life as well as spots tourists will recognize, while the text teaches the basic parts of speech. It is very difficult to put together a successful rhyming book--I've refused to publicly review many children's books that stretch words into rhyme while losing their meaning and missing a successful read-out-loud rhythm. Add the difficulty of writing a book about grammar and it's clear that author Irina Dolinskiy is taking on a tremendous task. But she did it. This book is fun to read aloud and, as an a English teacher, I can see myself reading and re-reading this book aloud to help my students with their grammar building blocks. The educational text wouldn't be half as interesting without Mark Adams' illustrations. While explaining the superb verb, the pictures show children in action, dancing, walking and skating. When noun is described as king, the picture shows action around a crowned Statue of Liberty. The bright and cheerful illustrations bring the text to life, while aiding children in learning the parts of speech. I highly recommend Parts of Speech Parade to read for fun and learning!